Okay… back to our spring road trip. 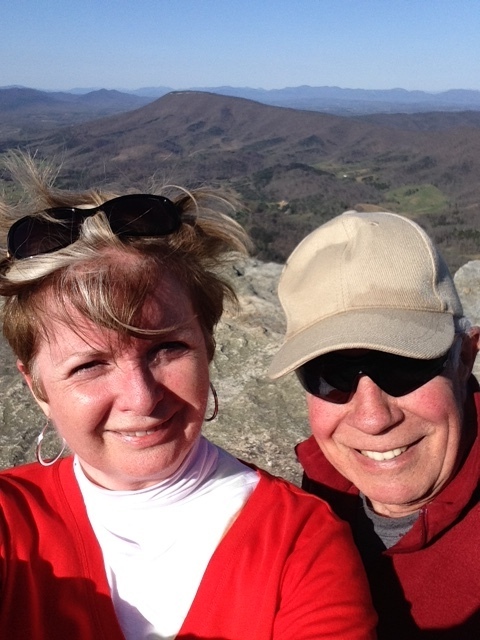 Hubby and I enjoyed South Carolina. Charleston was lovely: beautiful historic homes, great beaches, fabulous restaurants. But along with the warm sunshine, there were lots of people, and traffic. After four days we were ready for something less busy, and more empty. And rugged. With more open space and many fewer people. So we headed for the hills, so to speak. 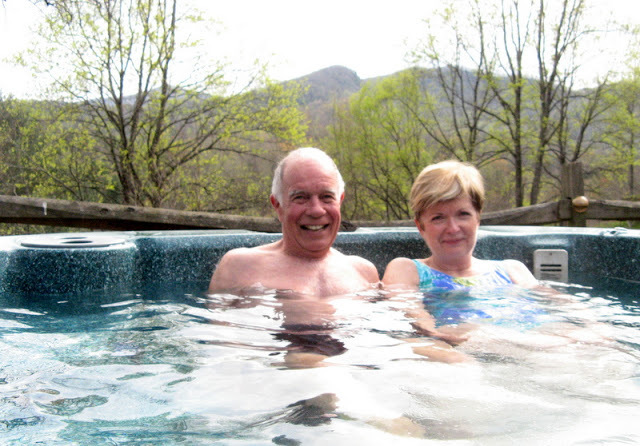 As I mentioned in my last post, we had booked a cabin in the Smoky Mountains of North Carolina for a few nights. 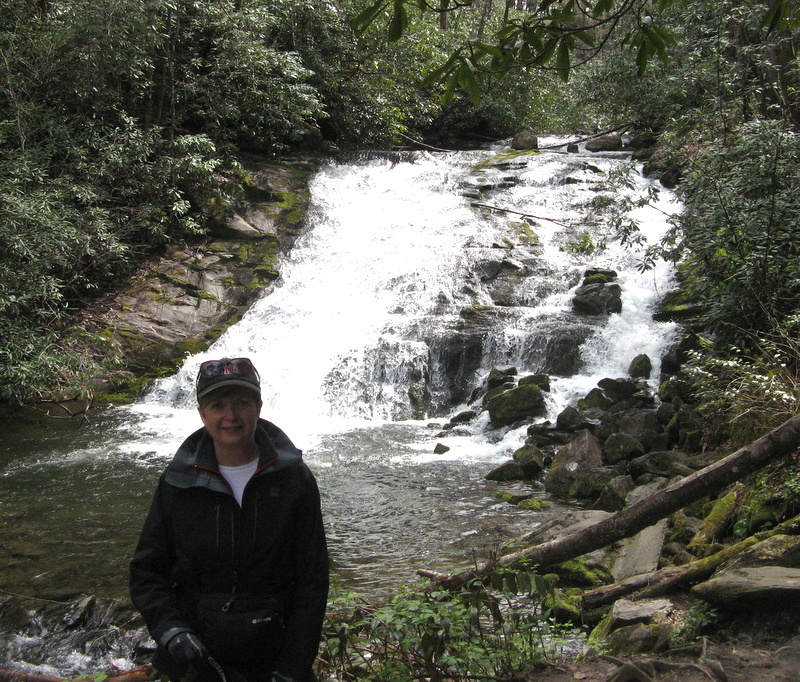 And we were looking forward to cooking for ourselves, and doing some hiking in Great Smoky Mountain National Park. And hopefully getting a look at the Appalachian Trail of which we’d read so much. 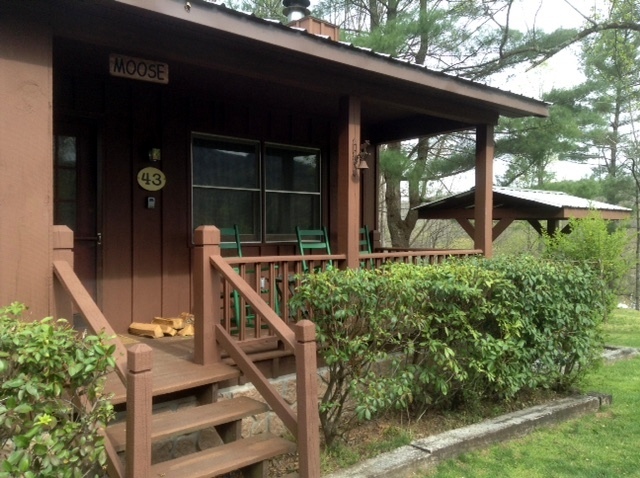 We love staying in cabins and cottages. And happy to have finally arrived and loving the rustic grounds of this place, we unloaded the car, and piled our bags and cooler onto the porch. A bit precipitously as it happened. We couldn’t get into our cabin. Despite following the e-mailed instructions we’d received from the owner, the “lock box” wouldn’t work, and since there was no one on site, and my cell phone had no signal (only Verizon customers get coverage apparently), we had to pack everything back into the car and drive to a small store nearby to beg the use of a phone. Apparently the owner of the cabins lives somewhere “far away,” according to the store owner. Even the local “staff member” whom we contacted lives twenty minutes away; but he explained over the phone the “trick” to opening the lock box was “to press on the grey part while trying to flick the switch.” Happily that worked. We were in and we unloaded the car for the second time that day. But the cabin was freezing. The wall thermostat did not appear to do anything. The gas fireplace looked dodgy, and with complicated instructions and no way of knowing if the gas was even turned on, no cell phone coverage in case of emergency, we steered well clear of that potential disaster. We managed to get heat by turning on the old baseboard heaters in each room. We pulled on our ski underwear that we’d packed for hiking, and laughed, “At least we aren’t in a tent, eh?” And later we were happy we’d brought the electric heating pad for my back, since the single quilt on the bed just didn’t cut it for warmth. Really? A cabin in the mountains in April… you’d think they’d have a duvet or at least an extra blanket. Anyhoo, the next morning when all the electrical outlets in the kitchen failed, and we had to move the coffee maker and the toaster to the bedroom, and the microwave to an outlet by the back door, I finally e-mailed the owner for assistance. Thank goodness for WiFi. A return message later that day said the the “trick” for resetting the kitchen outlets was “to press a reset button on the shaving outlet in the bathroom.” Of course. Now why didn’t we think of that? You see, folks, the “trick” to enjoying travel is to be flexible and to have a good sense of humour. And to look at all glitches as fodder for blog post stories. No more glitches that day, though. 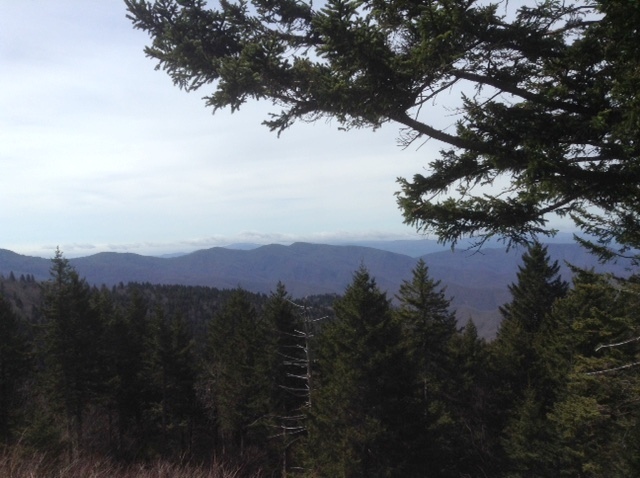 We drove into Great Smoky National Park to visit Clingman’s Dome, at 6643 ft, the highest point in the park. 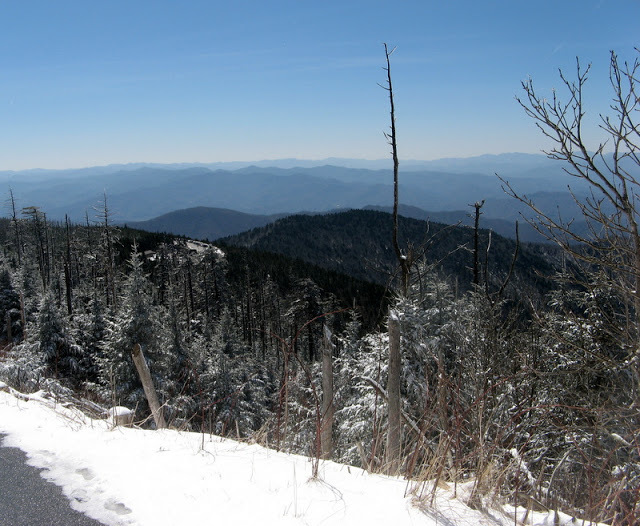 The sign at the park entrance said the Clingman’s Dome road was closed, probably due to the dump of snow they’d had overnight. But we took a chance and carried on. And by the time we turned off the main road and began the ascent, it was open. The temperature (and the wind) was brisk when we arrived at the parking lot to start the short, but steep, walk up to the viewing tower. Lucky for us we had packed our toques and gloves, and were wearing our ski underwear. Some people were not so fortunate, and one lady was attempting the walk swathed in what appeared to be a heavy blanket. That must have been awkward. 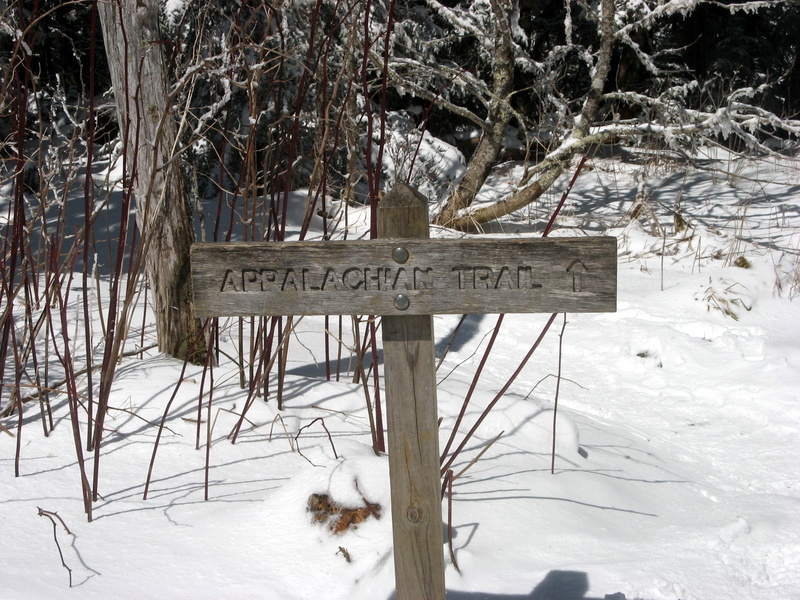 We saw hikers heading down this section of the Appalachian Trail, but we didn’t join them. 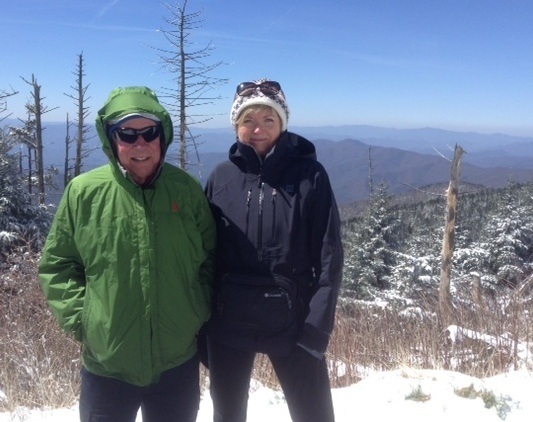 We carried on up to the viewing tower on Clingman’s Dome. Stunning view isn’t it? 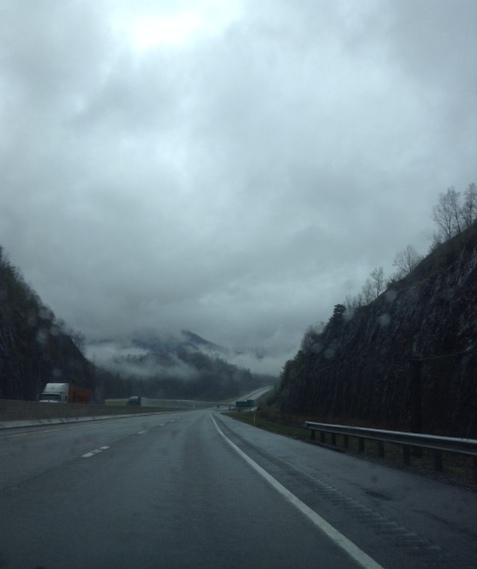 Row upon row of exquisitely smoky mountains. 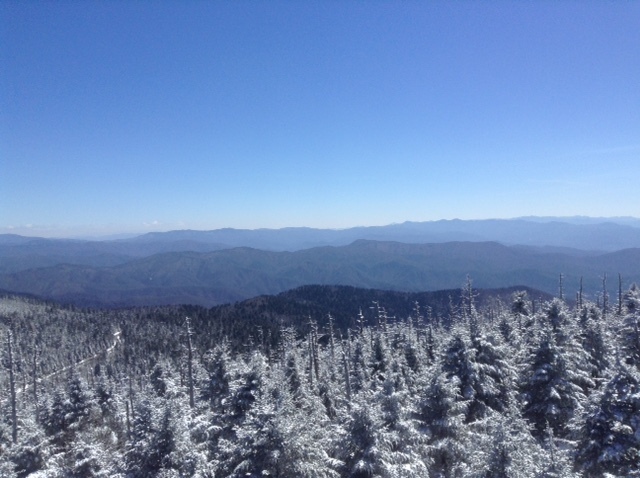 And thus the glitches came to an end, and we began three days of sunshine, bluer than blue skies, and gorgeous scenery. The snow made it all the more lovely. I felt like bursting into song or quoting a Robert Frost poem, but I restrained myself. I’d been warned after an embarrassing Macbeth quoting incident at Dunnottar Castle in Scotland. Poor Hubby, the perils of travelling with an English teacher. That was surreal. Perhaps he’d come to this quiet bench for a bit of Sunday morning meditation. 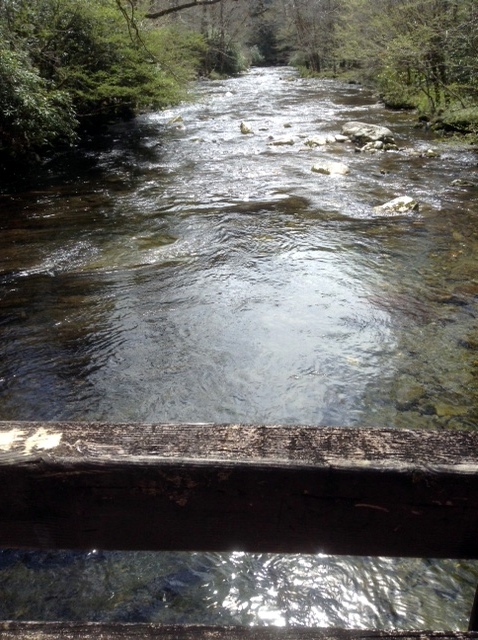 When we crossed the wooden bridge over this fast flowing creek, we couldn’t resist tossing sticks into the current, then running to the downstream side to see whose “boat” was winning. I don’t like to brag… but, well… you can guess where this is going. Spring makes you feel like a kid again, doesn’t it? Back at our cabin after our walk, the hot tub (which by the way worked perfectly) felt verrry good… but did nothing for my serious case of post-hike hat head. 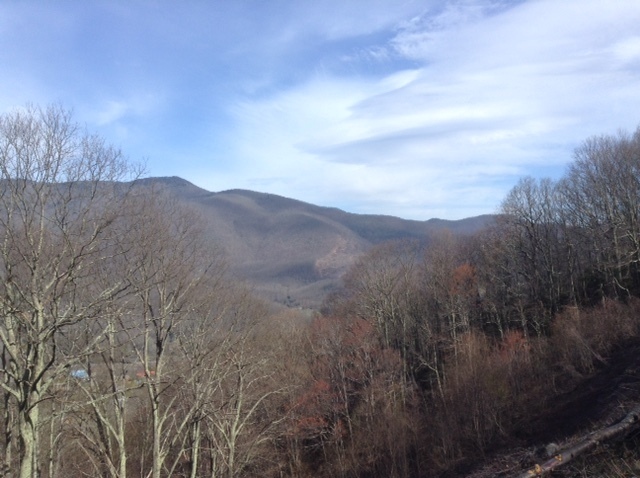 On our last day in North Carolina we drove part of the Blue Ridge Parkway. We’d thought about doing this on our “get-away day,” as Hubby calls it, but an ominous weather forecast helped us to change our minds. We’ve driven some beautiful, twisting, mountain roads in our travels over the years, and this one did not disappoint. Thank you Mr. Weatherman. 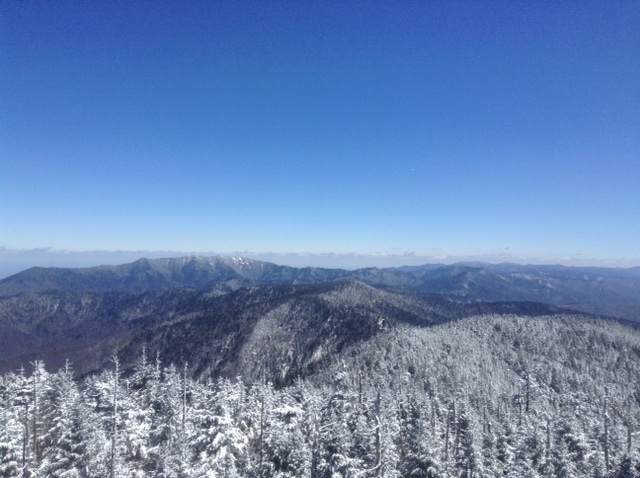 If we hadn’t paid attention to the forecast, the view below is all we’d have seen. Actually it’s all we did see, for a while anyway, on our “get-away day” as we headed north. Rain. And low clouds. And mountains hidden by more clouds. Kind of magnificent in its own way, though, isn’t it? We had one more stop before we headed home. 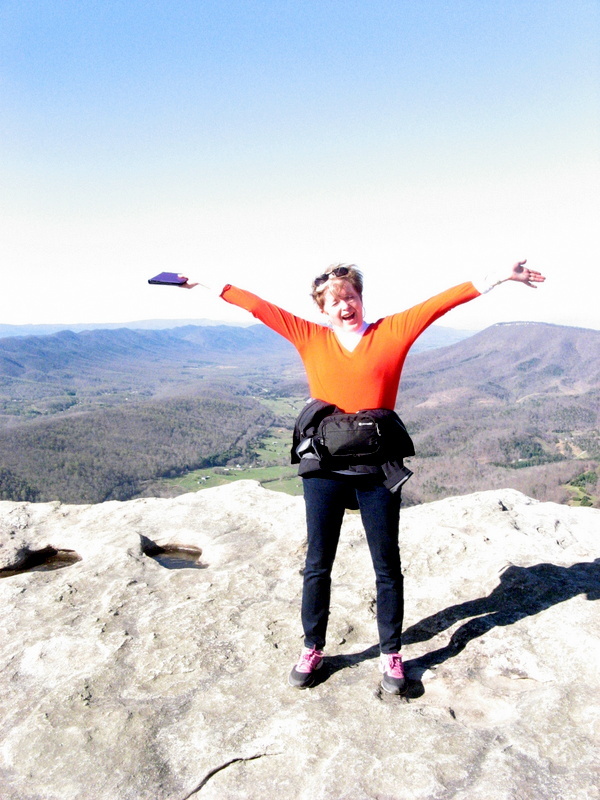 We planned to find a hotel near Roanoke, Virginia and hike in to McAfee’s Knob, one of the most famous overlooks on the Appalachian Trail. 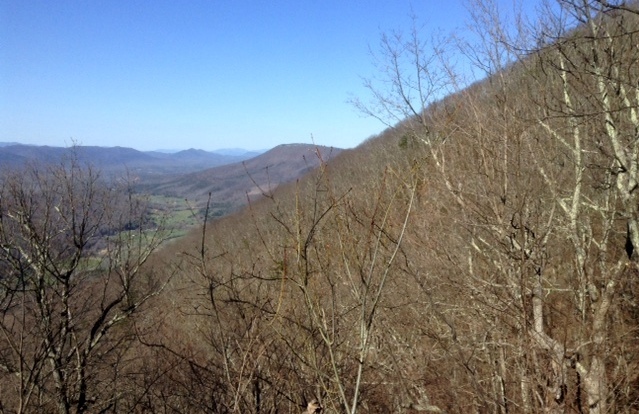 After reading Bill Bryson’s book on the trail, and then watching the Robert Redford film based on Bryson’s book… we couldn’t get the idea of McAfee’s Knob out of our heads. 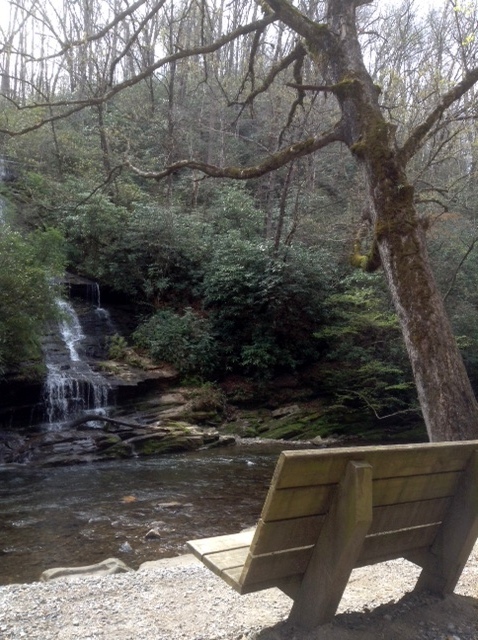 And Hubby had done some research, and read that it was a thirty-five minute hike one way. Ha. A veritable doddle. Cue the ominous music here. 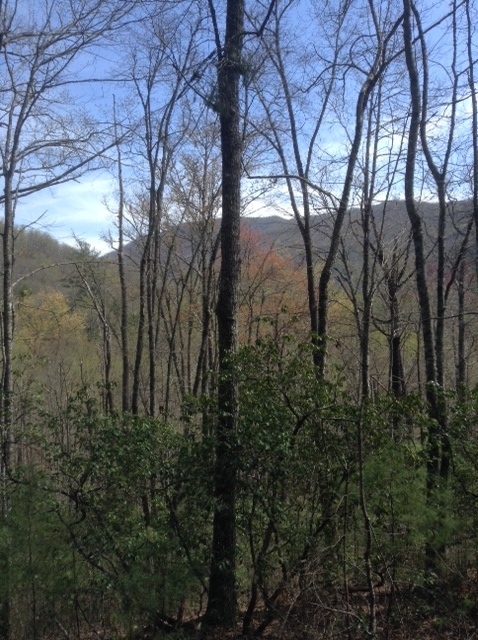 We checked into a hotel in Salem, near the head of the trail to McAfee’s Knob, and as it was only three-thirty in the afternoon, and the weather had turned out to be beautiful, we decided to do the walk right then instead of the next morning. The sign board in the parking lot said the hike was 3.9 miles. One way. So definitely not thirty-five minutes. Ah well. We needed some exercise. We’d been in the car for the best part of two days. Nothing ventured and all that. We set off. And walked. And walked. And walked. Up hill mostly. Almost entirely, in fact. After an hour or so, we spied what turned out to be an old fire road that ran alongside the trail, and we slithered down a side-hill to walk it. Easier on the feet than the rocky trail. At one point, we met an elderly man who was sitting on the bank beside the old road, digging wild garlic. Sounds like the beginning of a fairy tale, doesn’t it? But we weren’t two children lost in the woods and he wasn’t a troll or a leprechaun. Hubby had a conversation with him about the merits of wild garlic soup, he explained how much farther to the top, and we went on our way. 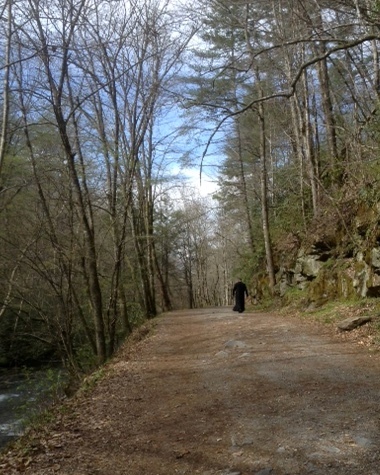 At one point, we turned off the fire road and back onto the trail. Soon, we clambered up steps as the trail headed directly for a cliff edge. “That must be it up ahead, ” Hubby exclaimed. This was the selfie I took when we discovered that the trail turned and ran along the spine of the ridge we were on. And carried on upward. Okay, I wasn’t really that upset. Just making a dramatic face for the camera. But where the heck was the damn knob? What-da-ya mean we’re not at the top? Too bad that Hubby’s camera was on the wrong setting when he took the shot below. The picture was terribly bleached out and I had to doctor it to be able to see anything. But as you can tell…. we made it! And the way back was all down hill. Well, mostly. Phew. It must have been after eight o’clock by the time we picked up take-out pizza and made it back to our hotel room. Where upon we had hot showers, turned on the “what is Trump up to today” show on CNN, and lolled on the beds, gulping down pizza, sipping wine, and feeling quite pleased with ourselves. I was fast asleep by nine-thirty. The next day we really did head for home. Our “mountain time” had been time well spent. And we were hoping that spring would be fully sprung by the time we reached Ottawa. So what have I learned on this trip? Well, you never know where you’re going to meet a priest or a helpful old man. Always travel with gloves and ski underwear… actually I already knew that one. Always, always wear hiking boots when we walk, even if I’m told that it’s only a short hike. Rocky trails are not kind to sneaker-ed feet. And I’ve decided that one should always calculate the length of a hike in miles before you start… pffft it’s only 3.9 miles one way. And in kilometres when you’re finished… wow, 12.6 kilometres in total, much of it climbing. I am impressive. See? Miles for motivation, kilometres for patting oneself on the back. Works for me. Now I really must wrap up this marathon post. Hubby has just brought my bike back from its spring tune-up and we are off for the first ride of the year. 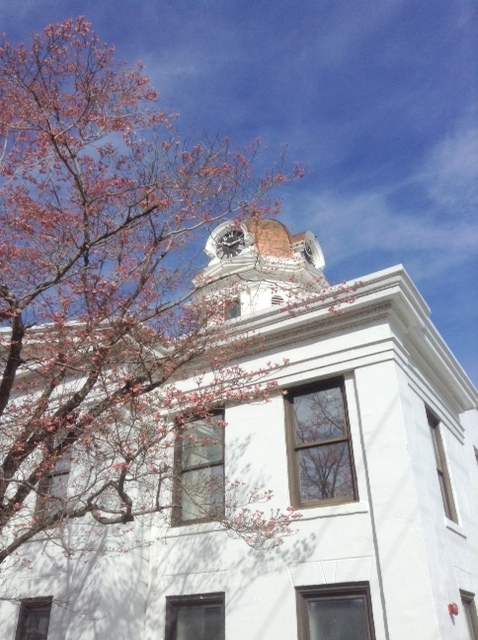 Spring… so glad it’s finally here. Sorry for the patchy posting schedule, folks. 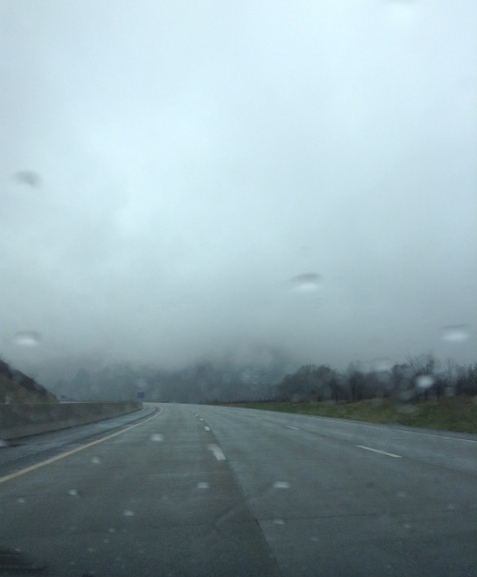 Between walking and driving, and walking and driving… not to mention the mountain of laundry when we came home. I couldn’t find time to write this post. What spring-y things have you been up to? 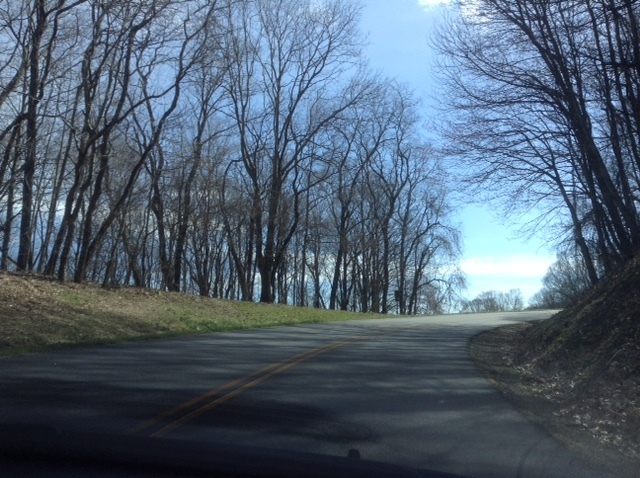 The Blue Ridge Parkway was pretty amazing…. I can imagine it's even more wonderful when the flowers are out. Well that was worth waiting for , a great post & it looks a beautiful area . I felt I was there with you & it brought back lots of memories of self catering holidays in the past .That cabin – we've opened many a door to a damp room full of junk . We would shuffle furniture , bring in lamps from spare rooms & even bought an electric heater once . Not so many shocks these days , with pics on the net & good old trip advisor . A sense of humour is still useful though . I'm not great on steep hills either . It's flat as a pancake round York so I don't practice hills enough . 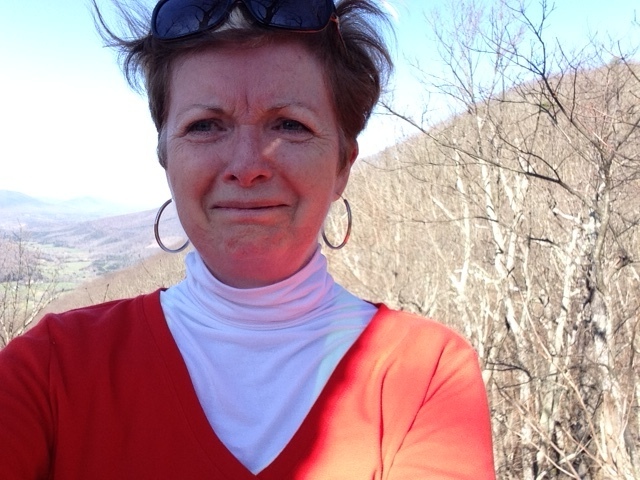 I'm usually complaining all the way up then happy & relieved all the way down – you wouldn't want me with you on a hike ! Thanks, Wendy. Sometimes you never know what you're going to walk into even with all the pictures on Trip Advisor. I will say that we usually have no problems… or none that are insurmountable. I also have done lots of furniture rearranging in my time. People seem to furnish cottages and B&B rooms without calculating that guests will want room for their own stuff. Or will maybe need a mirror that is near an electrical socket for a blow dryer. I remember one place we stayed in Scotland that we really liked except that the only mirror was on one side of the large room and the electrical socket on the other. Eventually Stu stood and held the ginormous mirror so I could dry my hair. That was pretty funny… wish I had a picture of that. Your Smoky Mountain leg was even more fabulous than I expected, Susan! You handled your cabin "glitches" marvelously. Most people would have lost their cool. It's easier to go with the flow when you can. Your photos of the mountains are beautiful. 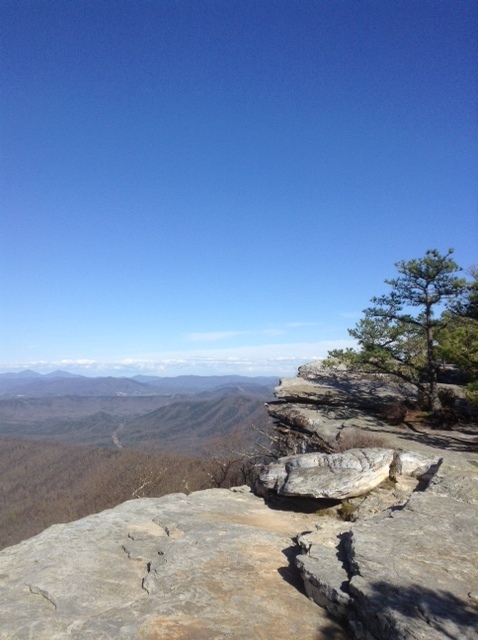 Oh my gosh…that hike to the knob! Whoa! I like your perspective because if someone had said 12.6 kilometers to me, it would have been a wrap. LOL! Thank you so much for sharing this with #UpsyDaisyLinkup! Thanks, Regina. It was a pretty good hike… not too, too long except that the way in was all uphill…and we had not expected it. So we weren't really prepared. Ah well… makes a better story. It was a great hike, Pepper. I did whine a bit… but only because we weren't prepared for the length. It was well worth the effort, though. Thanks, Frances. I used to store them up to share in stories to my creative writing class… now I just blog them. Much more fun to write about than clear sailing. I know, eh… we never had before either…. that was amazing. Thanks, Rosie. I had never encountered a lock-box before. Live and learn. We have a hot like that on every high place we've ever hiked into. It started as a joke a few years ago when a tourism site for Newfoundland featured a hiker at the top of Gros Morne doing just that. So when we hiked up to Gros Morne that summer (our first ever big hike at 7 hours) we both posed to imitate the famous shot. And we've never stopped doing it. Too bad you won't have time for a side trip to Newfoundland when you're in Canada this summer. It's wonderful…and unique in North America.